HONG KONG, 3 October 2016 – South China Morning Post Publishers Limited, Asia’s leading media company, is proud to have honoured seven unsung heroes and enterprises at the 4th Spirit of Hong Kong Awards presentation dinner last Friday (30 Sep). The occasion also marked the launch of One Love One Hundred Heroes, a compilation of stories and heroes acclaimed by the Spirit of Hong Kong Awards. At the 4th Spirit of Hong Kong Awards presentation ceremony are (front row from left) Mr Rog Thomas and Mrs Tina Thomas (parents of Mui Thomas, People’s Choice Award and Overcoming Personal Challenge Award winner), Mr Alan Lee Siu-lun (Innovating for Good Award winner), Ms So Kam (Compassion Ambassador Award winner), Guest of Honour Chief Executive the Hon. C Y Leung, Mr Raymond Ho (co-founder of Chu Kong Plan, Lion Rock Entrepreneur Award), Mr Thomas Lau, (founder of Navigator Consultancy, Corporate Citizen Award), Mr Jacky Ko Chung-kit (Community Contribution Award winner), Ms Choi Eun Young (mother of Ike Park, Cultural Preservation Award winner), (back row from left) Sino Group Executive Director Dr Daryl Ng Win-kong, SCMP Publishers CEO Robin Hu, Sir David Akers-Jones, Sino Group’s Group General Manager Nikki Ng Mien-hua, Armada Group Chairman Dr David Pang, Professor Frederick Ma Si-hang, Mr. James Blake, SCMP Editor-in-Chief Ms Tammy Tam, the Hon. Ronald Arculli and Hong Kong Council of Social Service CEO Mr Chua Hoi-wai. 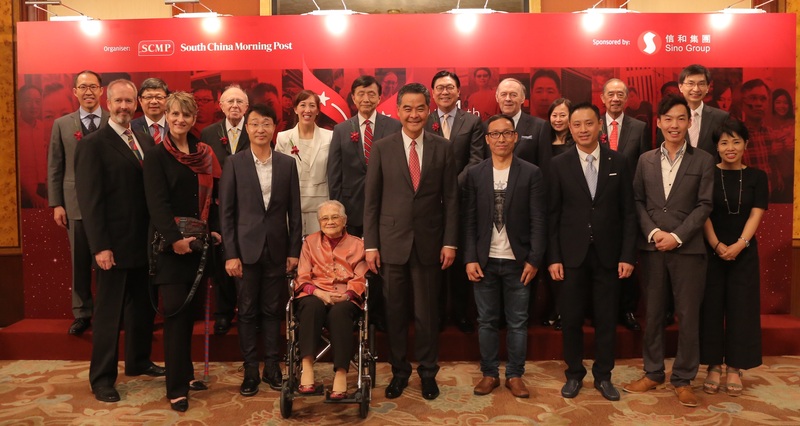 Established in 2013 in conjunction with SCMP’s 110th anniversary celebration, the Spirit of Hong Kong Awards is an annual platform that galvanises a variety of community organisations for nominating ordinary yet exemplary citizens or enterprises. The Awards celebrates these unsung heroes for their admirable deeds in overcoming personal challenges, contributing to the community, acts of self-sacrifice, innovating for good, cultural preservation, good corporate citizenship and entrepreneurship. The SCMP has been sharing their stories with readers on our digital platforms and print edition. On top of the 100 stories, One Love One Hundred Heroes features encouraging words of wisdom from exemplars of Hong Kong, including the Hon. Ronald Arculli, Ms Shelley Lee Lai-kuen, Ms Sarah Lee Wai-sze, Professor Frederick Ma Si-hang, Mr Rex Tso Sing-yu, the Hon. Anna Wu Hung-yuk and Dr Allan Zemen. Available in English and Chinese editions, the book is priced at HKD$120 and available for sale online via spiritofhk.scmp.com or through contacting us at shk@scmp.com. One Love One Hundred Heroes is funded by Sino Group with all revenue to be donated to Operation Santa Claus, a registered fund-raising charity established by the SCMP and Radio Television Hong Kong to provide funding to lesser-known charities. First published in 1903, the newspaper has developed an enviable reputation for authoritative, influential and independent reporting on Hong Kong, China and the rest of Asia. Available in print, mobile, tablets and online through scmp.com and e-reader editions, the South China Morning Post reaches a global audience with daily breaking news, analysis and opinion, multimedia articles and interactive forums. The South China Morning Post received 200 awards in 2015-16 for excellence in editorial, marketing and technical capabilities. Other titles in the company include the Sunday Morning Post, STYLE, Destination Macau, The PEAK, HK Magazine and The List.